You can’t keep your kids from ever hearing bad language, but you can prepare them and teach them the why behind your family and gospel standards. 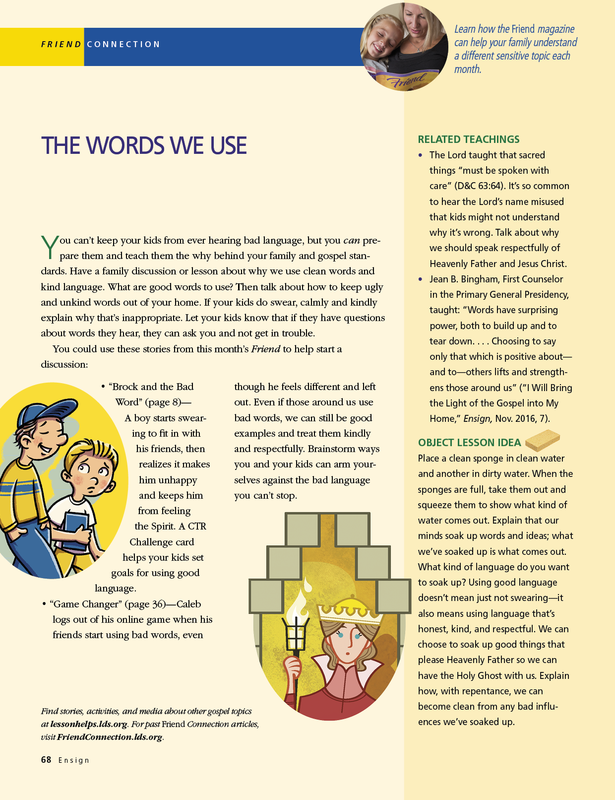 Have a family discussion or lesson about why we use clean words and kind language. What are good words to use? Then talk about how to keep ugly and unkind words out of your home. If your kids do swear, calmly and kindly explain why that’s inappropriate. Let your kids know that if they have questions about words they hear, they can ask you and not get in trouble. “Brock and the Bad Word” (page 8)﻿—A boy starts swearing to fit in with his friends, then realizes it makes him unhappy and keeps him from feeling the Spirit. A CTR Challenge card helps your kids set goals for using good language. “Game Changer” (page 36)﻿—Caleb logs out of his online game when his friends start using bad words, even though he feels different and left out. Even if those around us use bad words, we can still be good examples and treat them kindly and respectfully. Brainstorm ways you and your kids can arm yourselves against the bad language you can’t stop. The Lord taught that sacred things “must be spoken with care” (D&C 63:64). It’s so common to hear the Lord’s name misused that kids might not understand why it’s wrong. Talk about why we should speak respectfully of Heavenly Father and Jesus Christ. Jean B. Bingham, First Counselor in the Primary General Presidency, taught: “Words have surprising power, both to build up and to tear down. … Choosing to say only that which is positive about﻿—and to﻿—others lifts and strengthens those around us” (“I Will Bring the Light of the Gospel into My Home,” Ensign, Nov. 2016, 7). Place a clean sponge in clean water and another in dirty water. When the sponges are full, take them out and squeeze them to show what kind of water comes out. Explain that our minds soak up words and ideas; what we’ve soaked up is what comes out. What kind of language do you want to soak up? Using good language doesn’t mean just not swearing﻿—it also means using language that’s honest, kind, and respectful. We can choose to soak up good things that please Heavenly Father so we can have the Holy Ghost with us. Explain how, with repentance, we can become clean from any bad influences we’ve soaked up.